I found this scene across the street from the Natchez Cemetery. 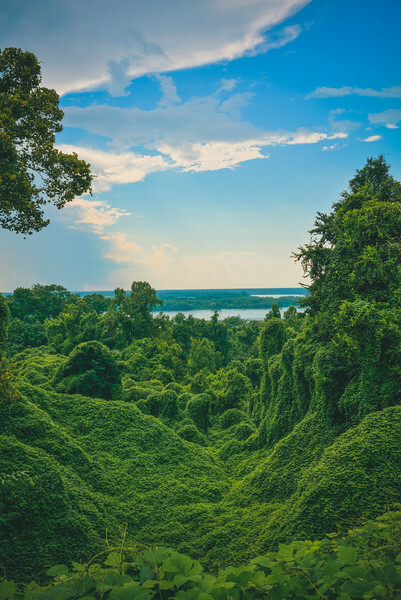 Looking out to the river on the horizonn you see nothing but Kudzu, a very familiar sit in Natchez actually, although not this much at one time. It really smoothed everything out and created this awesome texture along with rolling curves of the outline of tree and shrub tops. It was really cool to see, especially from this vantage point. This shot is very similar to one I posted a couple of weeks ago here. This one is different because it is only a single shot and also a 30 second exposure which really catches the light trails from the cars and the rushing water of the Mississippi River giving it a nice smooth look with great reflections. The horizon gave off a nice pink glow as well. I discovered this place on a postcard while visiting Longwood in the gift shop. I quickly discovered where it was located and my wife and I decided to check it out. While we were eating lunch at Fat Mamma's Tamales, we actually met the owner of Mammy's who also gave us some great suggestions on other places to check out in Natchez. 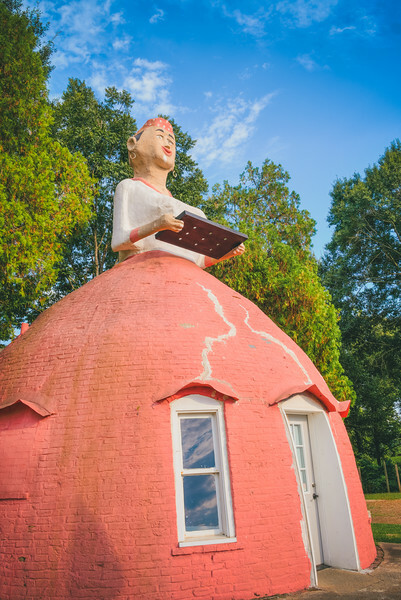 Mammy's is located on Hwy 61 just south of Natchez. This is a shot from the Natchez Cemetery. The land that the cemetery sits on is full of rolling hills, which allowed me to get a nice landscape shot from above the surrounding area, giving a nice shot of the green grass and beautiful monuments and tombstones. 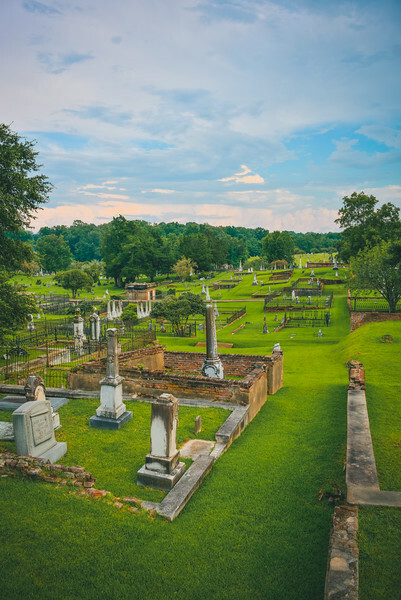 The Natchez Cemetery is full of history and interesting graves and statues, such as the "Turning Angel", the "Rocking Chair" grave, "Louise the Unfortunate", the "Thunderstorm Grave" and others. I highly suggest you check it out next time you are in Natchez. 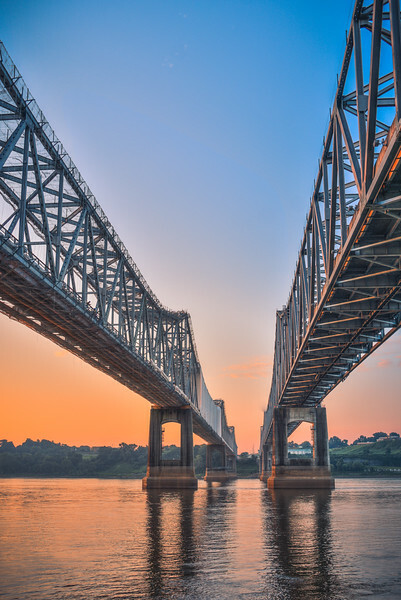 This is the Mississippi River Bridger in Natchez, taken from Louisiana. I had to go to Vidalia, La. to be able to get under the bridge and walk up to the shore of the river. It gave me some great angles to get shots of the two bridges that cross the Mississippi, offering a different perspective. This was taken at sunrise with a beautiful orange glow. 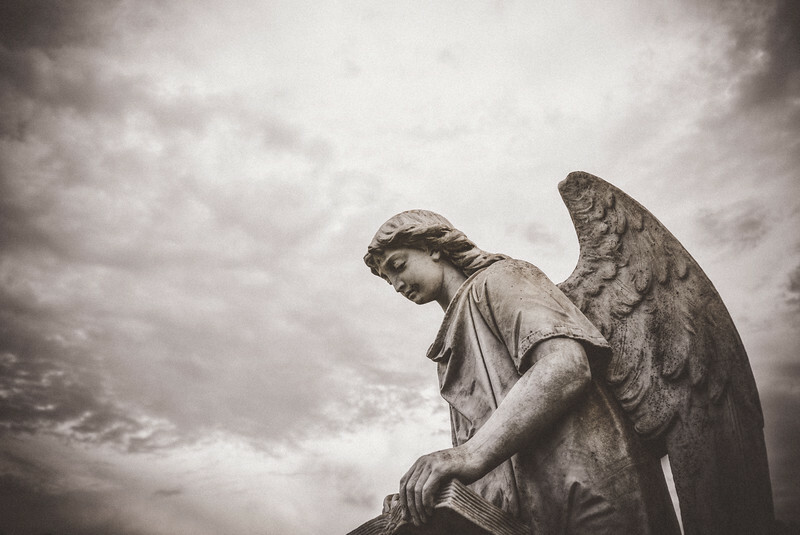 This statue is known as the Turning Angel at the Natchez Cemetery, a beautiful memorial to ones who died in an explosion at a pharmacy in downtown Natchez. The owner of the pharmacy had this statue erected to overlook their graves. It is said that when you drive by the angel at night, her head turns to watch you as you pass. Yesterday I had a great gallery opening along with a fellow local artist at the Louise Campbell Arts Center in West Point. Thanks to all who came out to support my work. 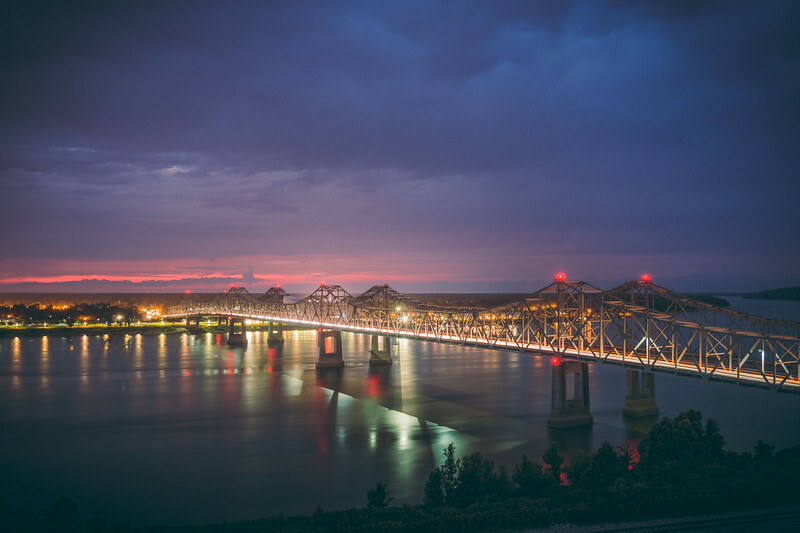 I am still sorting through all of the photos I took during my weekend in Natchez and the surrounding area. There are A LOT of photos! We had a great visit to the Natchez Cemetery, which is a very beautiful place and well kept up. Lots of gaudy tombs and mausoleums all over the rolling hills. 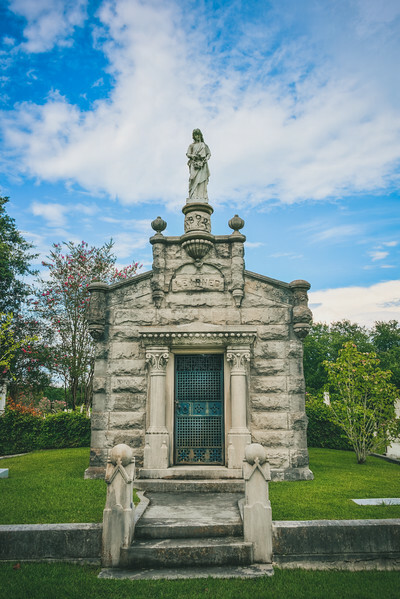 This is one that stood out to me, it is a family Mausoleum that is absolutely beautiful. You can look through the door and see where the coffins are/were placed. Very very cool. 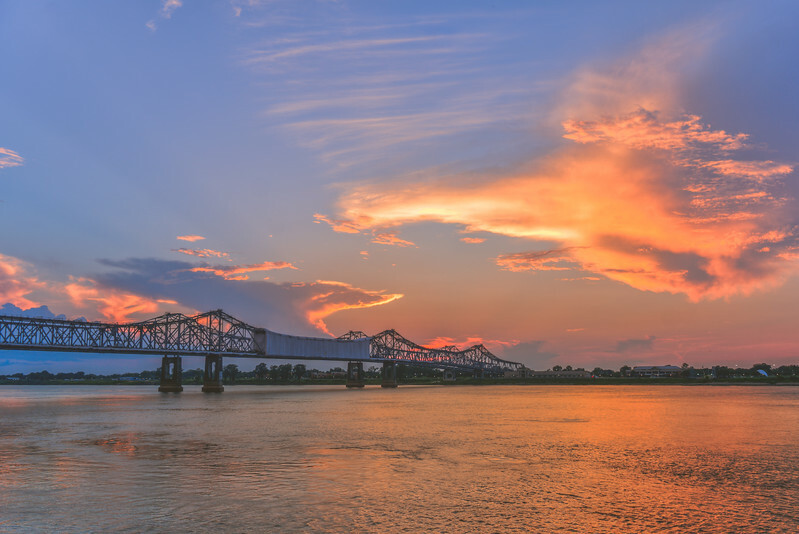 Here is another sunset I was able to capture on the banks of the Mississippi River with the bridge in the background. Nothing like a good sunset on the water. I am still wading through all of the photos I took during my weekend in Natchez and the surrounding area, so you will start to see some photos from the area outside of Natchez real soon. But I got a lot of fantastic photos from Natchez so don't think I'm done with photos from there. 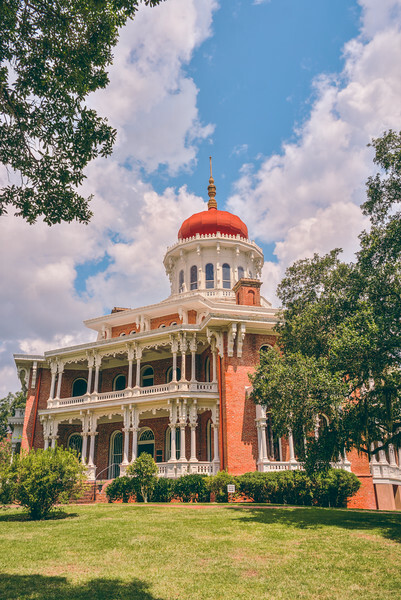 This is Longwood mansion, one of the main things on my list to see while were in Natchez, so we spent the $18 apiece to take the tour and, I have to say, it was well worth it. The tour guide was fantastic and told us lots of stories and tales to go along with this unfinished mansion. It is the largest octagonal house in the country, and it is a huge place with a beautiful property. I won't tell the story for you, but if you haven't heard the story of Longwood before I suggest you look it up and do some reading. While my wife and I were eating lunch at Fat Mamma's Tamales, we met a couple of locals who told us about an abandoned house in town called "Arlington House" and suggested we go check it out, but being warned that it was in severe disrepair. I, loving abandoned places, was immediately intrigued so later in the day we went to check it out. What a beautiful place this home must have been in it's heyday. 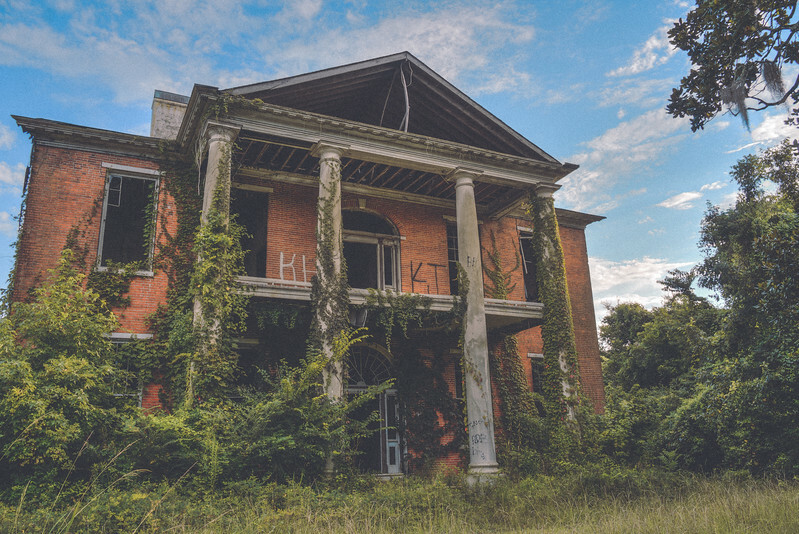 It's a grand house with these huge columns overgrown with kudzu. I do think that abandoned places like this are still beautiful in some haunting way, begging your mind to wonder what it must have been like and the stories it has to tell. I love finding these places and exploring them and capturing the beauty that I see and that these place still hold. Unfortunately, as is the case with all abanondoned places that are easily accessed, vandals have made their mark and taken away from some of the beauty that even its abandonement holds.